The Delaware County Junior Fair court for 2017 features, from left, Junior Princess Kayla Kramer, Prince Ethan Bender, Senior Princess Claire Schenk, Prince Cole Wecker, Queen Kaitlin Meade, King Donnie Smith, Senior Princess Bree Vining, Prince Jacob Carey, Junior Princess Faith Myers, and Prince Gestin Delelles. The fair is scheduled for Sept. 16-23. Young people who will serve as royalty for the upcoming Delaware County Fair were selected last week. Junior fair royalty for 2017 was crowned last Thursday evening at the Delaware Area Career Center North Campus. 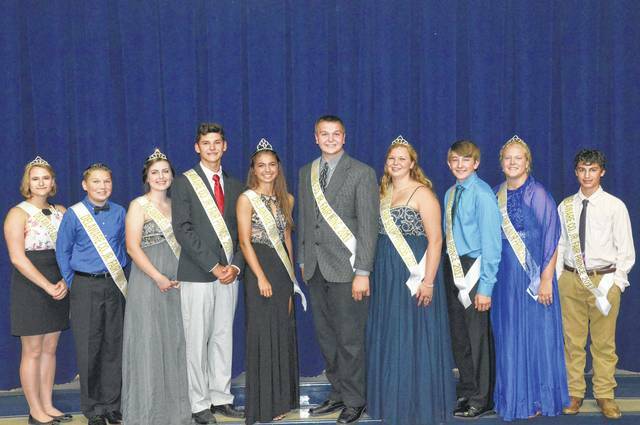 Ten local young people received crowns and sashes as members of this year’s court for the fair, which is scheduled for Sept. 16-23. Reigning over the court are Queen Kaitlin Meade and King Donnie Smith. Meade, a student at Big Walnut High School, is a member of the Kountry Kids 4-H group. Smith, a student at Buckeye Valley High School, is a member of the Rabbits & Roosters 4-H club. The rest of the royalty for the 2017 Delaware County Junior Fair features Senior Princess Claire Schenk from Bitz ‘N’ Pieces, Senior Princess Bree Vining of Norton Neighbors, Junior Princess Kayla Kramer from Ostrander Merry Shamrocks, Junior Princess Faith Myers of Walnut 4-H’ers, Prince Ethan Bender from Delaware Town & County, Prince Jacob Carey of Hams & Udders, Prince Gestin Delelles from Cinch N Saddle, and Prince Cole Wecker of Kountry Kids. Gates will be open from 8 a.m. to 9 p.m. daily at the Delaware County Fair, according to the fair website. Buildings will be accessible from 10 a.m. to 9 p.m. each day. Rides will operate from 11 a.m. to 10 p.m. daily, weather permitting. Daily admission is $6 per person age 9 and older. Children ages 8 and younger are admitted at no cost. Senior citizens age 55 and older will be admitted for $2 on Tuesday, Sept. 19. On Jug Day, which is Thursday, Sept. 21, ages 9 to 17 will be admitted for $6 all day. Ages 18 and older pay $15 until 5 p.m. and $6 after 5 p.m. Parking is $5 per car until 5 p.m. on Jug Day. Military veterans will be admitted free of charge on Friday, Sept. 22. All-day wristbands for amusement rides can be purchased for $15. Individual tickets cost $1 each. Most child rides require two tickets and adult rides need three tickets. For information about the 2017 Delaware County Fair, visit www.delawarecountyfair.com.